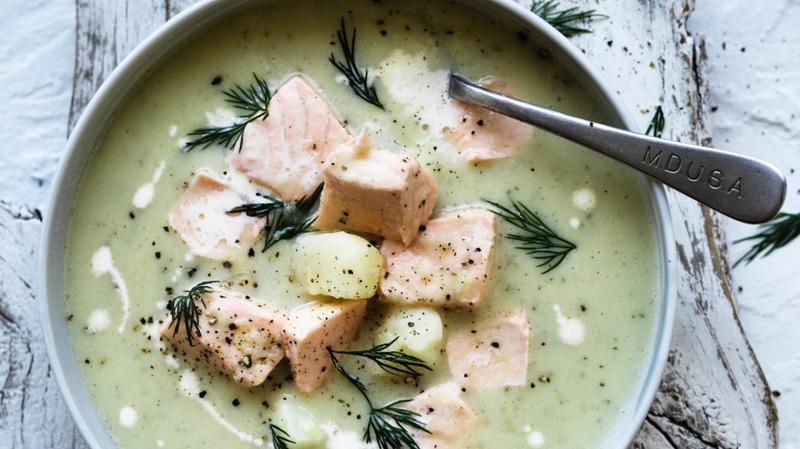 A thick, creamy and comforting Scandi-inspired fish soup, chockers with fennel, potato and dill, that's very simple to put together. 1. Melt the butter in a heavy pan, add the leek and fennel and cook over low heat, tossing occasionally, for 10 minutes until softened. 2. Add the hot stock, potatoes and salt, and simmer, partly covered, until the potatoes are tender (about 20 minutes). Blend half the soup in a blender with half the dill and all the parsley, and return to the pan. Add the cream, and bring up to a simmer. 3. Cut the salmon into bite-sized chunks and add to the soup. Simmer for three minutes or until salmon is just cooked through. Serve with a swirl of cream, pepper and remaining dill. This soup is great on its own – but team it with an egg mayo toastie on the side and it's a fortifying meal.